Bierstadt Lake is a favorite location of mine for photography in Rocky Mountain National Park. I just cant seem to get enough of this beautiful lake which is located on top of the Bierstadt Moraine. 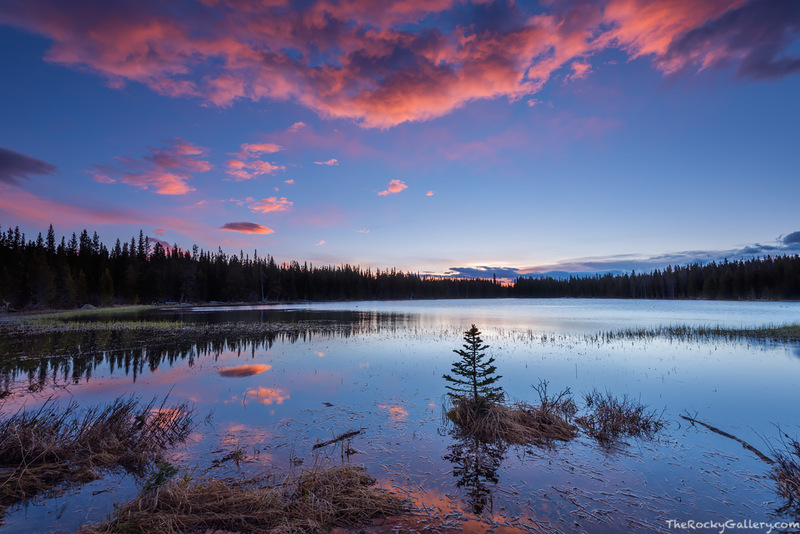 Sunrises are spectacular here from both the west and eastern shores of Bierstadt Lake. Looking west from the eastern shore, Bierstadt Lake presents a breathtaking view of the mountains and continental divide. The view from the western shore is more subtle, but when conditions are right it can be just as beautiful. This late May morning, Bierstadt Lake was full from the spring runoff. The shoreline was flooded and this small pine tree was surrounded by water. A few weeks later the water will receed from the shoreline and this tree will once again sink back into the treeline along the shore of Bierstadt Lake. Photo © copyright by Thomas Mangan.